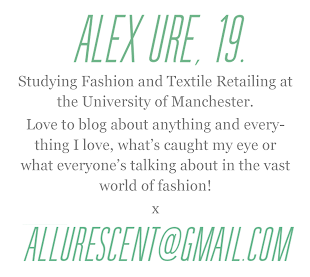 allurescent: New Accessories - On the Cheap! New Accessories - On the Cheap! 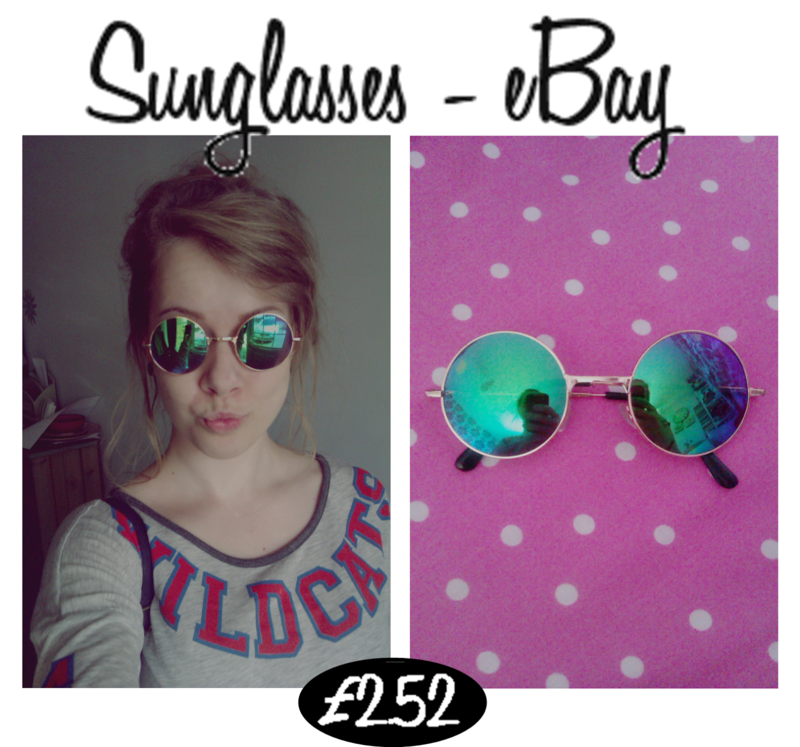 Ordered these gorge mirrored sunnies about a month ago when the UK heatwave was in full swing; this teamed up with seeing the colour-mirrored sunglasses trend emerging (on the blogging and celeb scene) and the price made them a mandatory addition to my sunglasses collection! 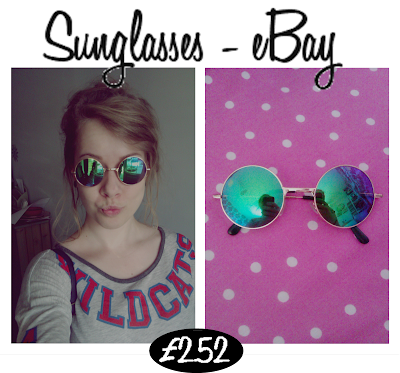 These only arrived a few days ago with the spike necklace later on in this post as they were shipped from China; definitely worth the wait for free postage, bank-friendly price and quality of the specs! Find them here. I'm just praying the sun hasn't packed up for the rest of the summer so I can wear them til my hearts content! Fell in love with these wedges when pottering around in the H&M summer sale when it first started but was disheartened when there wasn't a pair in my size! (Story of my life and I'm sure many of yours). I was so besotted with these shoes that I had to get them online. However online they were priced at £15:( but my best friend being the resourceful bargain hunter that she is, managed to find a free delivery code and a £5 off code and she bagged herself a lovely pair of wedges too with these voucher codes which I've featured at the end of this post. I wanted to wear these when I went to London (Outfit post here) but they didn't work as well with the outfit and were noticeably less comfortable than alternative shoes but I wore them at the weekend for my early birthday celebration here! 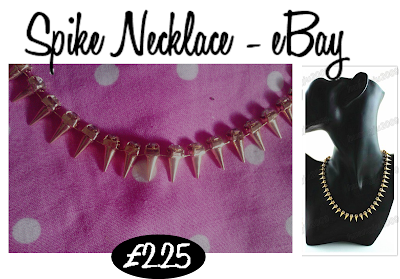 Bagged this Spike necklace from the same eBay seller as the sunglasses and reckon I'll get a lot of wear out of it this Autumn/Winter; fuelling the grungy punk edge of some of next seasons trends. Find the spike necklace here. 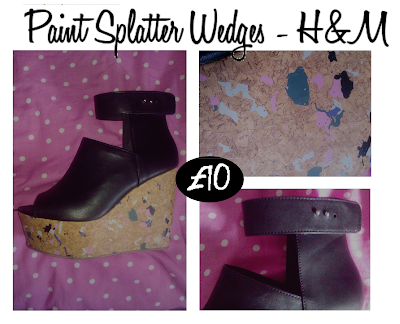 These are the wedges my friend ordered at a bargain £7 from H&M when I got the paint splatter ones. My friend has an unhealthy obsession with aztec prints but who doesn't love a good aztec print! Especially on these shoes! Very proud of myself for uncovering this ring for a pound at Primark hidden away in the sale stand. I liked it in store but didn't love it but when the light hits it outside it looks so good and gives a kaleidoscope effect that I love! Nothing more satisfying than picking up some good bargains so hope you enjoyed my recent finds! I love the aztec shoes from H&M ! Those are the best finds! 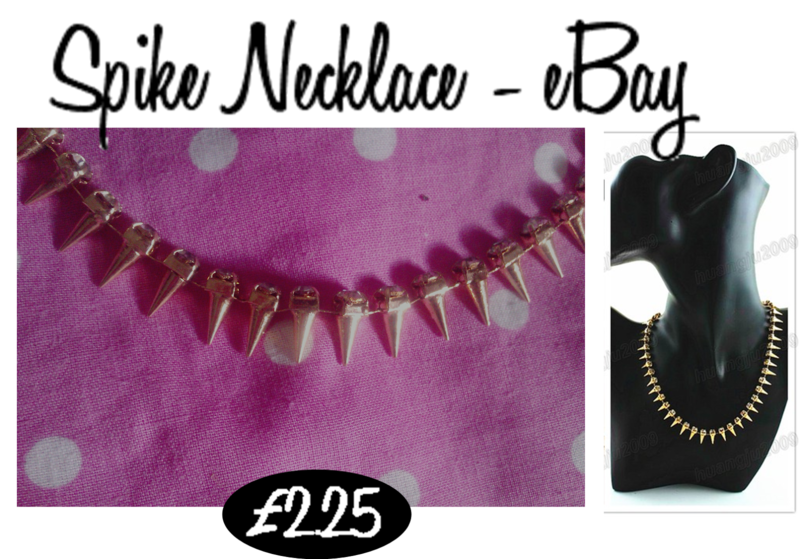 !Love the spike necklace! 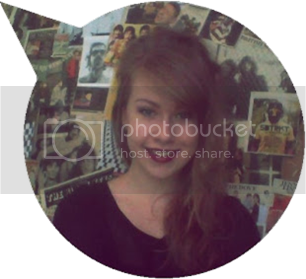 I'm following you on GFC and Blolovin! I love great, cheap finds! 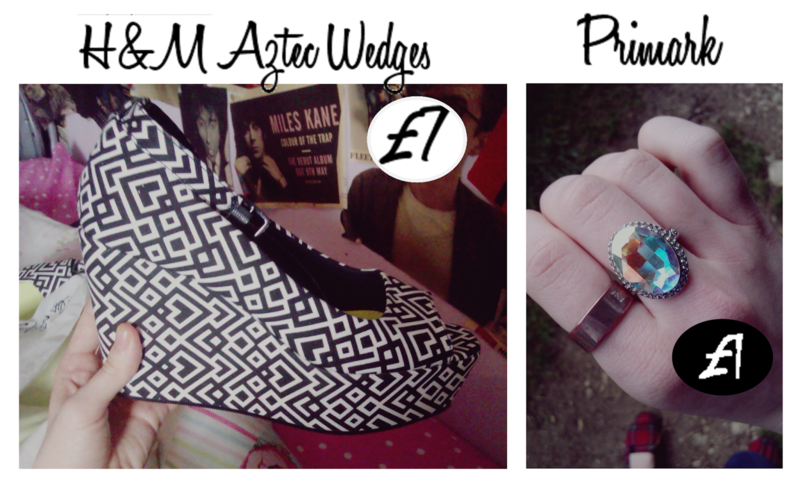 I really like the spiked necklace and those H&M aztec wedges are pretty awesome too. 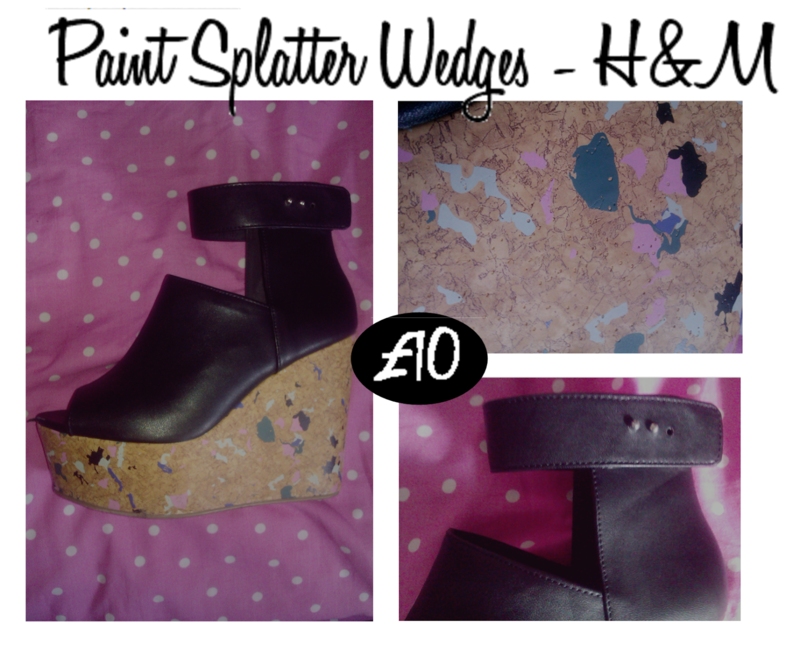 I love wedges! Those aztec ones are amazing, i love finding cheaper goods for still the same good quality!